In Parts I and II of my Rate T Study we saw the remarkable ability of monthly momentum Oscillators, based only on the fluctuating yields of the Long Term Treasury bond to project the date of key market lows. This behavior was very acceptable during the period from 1945 to 1982 when long term rates were generally rising as inflation grew steadily stronger after the second world war. This was also a unique period of history where Ts acted normally, that is, there always was a strong rally in the right side of the successive Ts, lifting rates steadily higher to an eventual projected peak. Because rising rates eventually hurt stocks, a market decline set in at some stage of the rate advance, and once begun, generally pushed stock prices lower until rates finally peak, then fell, often as the result of a business slowdown. As I am sure you know falling long term rates are nearly always bullish for both stocks and the economy for a wide variety of good reasons. So as long as rates were rising in the right side of a Rate T, and made a satisfactorily peak near the T’s projected top date, we could expect a market low to appear at the Rate T’s projected peak date. This very important, of course, because the Rate T’s projected top date is known in advance and thus gives advance warning of the impending market low. And our Rate Study concluded we could generally be satisfied with the monthly rate T projections for this long period of rising inflation. However after 1982, as the 8th Mega-T got under way, fueled in large part by declining inflation, long rates began a steady decline and the T concept used in this study had problems coping with projected rises in rates within the right side of big Ts, probably because they were very muted or non existent. My first attempt to solve this problem was to switch to daily long term rate data which finally became available in 1978. Then I added a shorter term oscillator design to handle the momentum measurements for what were clearly much shorter, and generally very temporary rallies in rates. My first oscillator designs were too short term in nature and we did not provide reliable projections. Then I noticed in November 1998 that very simple Ts, like the ones constructed in the daily chart below, were capable of giving some accurate market low projections. Also in some cases we were seeing rates peak as they should at the right end date of these simple Ts. All this suggested that a new oscillator design concept might restore the concepts usefulness in this new era of declining inflation. The results, as we can see above, look promising because there are enough T examples here to illustrate accurate projections of market lows. Also any T that looks constructible does point to a market low which is encouraging for the future. For this reason I am moving on to a refinement of this 5 year history so it can be investigated on a more expanded time scale. We will see if the construction rules for more accurate T projections can be undiscovered. It is also possible that these constructions will reveal a simply momentum oscillator design that will help us make practical use of this tool. The real advantage of this concept, if more back pan out, is that the ability to project market lows with any degree of accuracy at all is extremely valuable, in fact more valuable than conventional T projections for market tops. For example, the last big T in the chart looks important and calls for a market low somewhere in the early part of the year 2000 as best I can determine. As I mentioned in my Jan 19th discussion, I am especially interested in finding new Tools that can find new opportunities. New buying opportunities like the ones that these kinds of Ts might be able to find are potentially more important than some of our big stocks market Ts. You will remember from earlier studies we saw that corrections of major advances we often just 50% corrections of prior run ups over the long term. This suggests that peaks are only 50% as important as major lows. In other words it is likely that bottom opportunities are twice as important to know about as potential tops. Hopefully the full study of this indicator will shed more light on these questions and potential opportunities. Next week I will have expanded this history and we can look at these Ts in more detail. 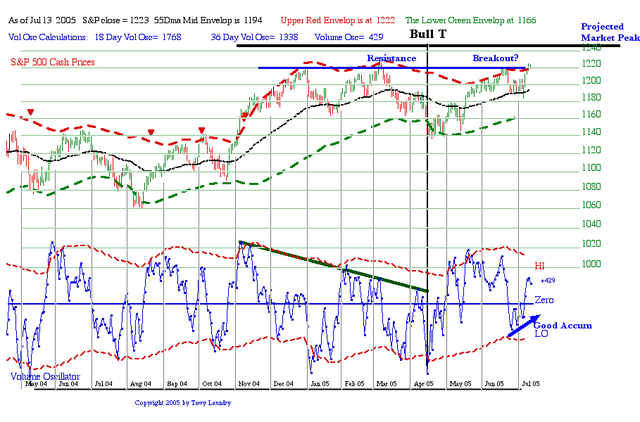 The Short Range Bull T for the S&P 500 is doing fine. The uptrend has almost 2 months to go in its bullish projection and the S&P has broken above the old tops resistance level. In response to John’s Long term Bond question I have posted my 1999 study below which pretty much explains the picture. I will comment further in my next update. The 30 year rates, symbol TYX, can be extended by going to bigcharts.com and entering TYX for a plot. 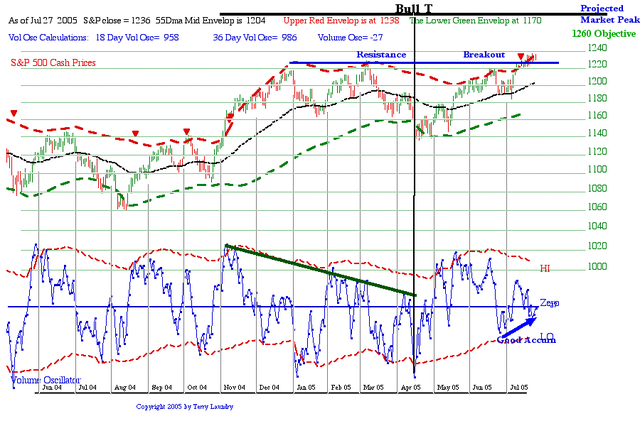 New Ts will become apparent for the period after this study with new market lows predicted. I will update the program and make future low projections from these bond Ts a part of my regular comments starting this Fall. Equity market peaks can be projected by Advance-Decline Ts (and other Ts) but the T center post low point of any T is unpredictable and needs to be evaluated in real time by other concepts. Market lows may be predictable in advance but only by coming at the market picture via Ts in interest rates as shown in the study. Essentially the task for future studies will be to show if rate manipulation by Rate Ts in order to influnce future market lows is analogous to rate maipulation by the Federal Reserve for the purpose of influencing economic trends. Finally, the last big T in the study is responsible to breaking the dot com bubble in the year 2000 from the mid March peak to the May low. This suggests that normal T behavior applies to Rate Ts. That is, the longer spanning Ts are more influencial than the shorter spanning Ts. In other words, big rate Ts probably cause big damage, small Rate Ts probably produce less important corrections. Click on the chart below for a larger image and drag to desktop if you want a printed copy. Next regular update scheduled for August 9th with a short note or any special projects on August 2. As the trend runs into the current Bull T’s projected peak in about 6 weeks it is a good idea to plan for the eventual topping, a correction into early Fall then the development of a new short range T to supply the traditional rally into year end and on to the new year.As noted S&P 1260 is a reasonable upside objective but it could do better. The key to interpreting the potential for these new T trends is the nature of the S&P 500 trend relative to the old resistance level around the 1220 level that had capped the longer term Advance-Decline T’s projection of a bull trend into March 2007 despite the expected 4 year cycle low historically due late next year. Since it is not really possible gauge the net effect of these two opposing forces the levels of the S&P provide the best reference point for us to see which force is winning the battle. The 39 week MA needs to hold any future weakness promoted by the 4 year cycles normal weakening in 2006. The old resistance level 1220 needs to hold the correction in Sept/Oct during the regeneration of a new T.
So confirmation of a continuing bullish trend into 2007 should show the recent break out above the 1220 resistance level has now become a floor for any corrections going into the end of the year. This is a simple way to demonstrate the ongoing influence of the big A-D T based on past T Theory trends. This entry was posted on April 10, 2013 at 4:38 PM and is filed under . . . T Theory®. You can subscribe via RSS 2.0 feed to this post's comments. You can comment below, or link to this permanent URL from your own site.